The Farmer’s World (Petton Books, Feb. 2016) is now available. 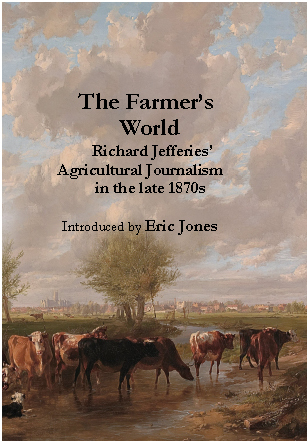 The book comprises all the articles (nearly 90) by Jefferies published in The Live Stock Journal and Fancier's Gazette in the late 1870s, along with a masterly introduction by Professor Eric Jones. The articles are forthright, almost campaigning, often urging readers to reconsider their conservative ways, to be innovative, to seek commercial opportunities and to tackle waste. ‘Middlemen’ were regularly disparaged, traditional methods of distribution questioned and imaginative schemes suggested to bring producer and consumer closer together. Jefferies also displayed a surprising ability in figures and a good grasp of mechanical engineering, explaining with clarity the workings of newly invented farming machinery. The essays collected here demonstrate Jefferies’ expertise in trade-paper journalism and contrast sharply with his later, lyrical work. He was a modernist of his time, and declares: ‘agriculture has become far too wide for the brain of any one man’. The soft-back book can be purchased from the Richard Jefferies Society at http://richardjefferiessociety.co.uk/farmersworld.html for £10 plus postage.